With durable plug and play solutions. Select and go with the compact, mobile, and adaptable solution for your palletizing and depalletizing operations. Boost your productivity with pre-engineered and customized automation solutions. Lift and manipulate heavy equipment for precise ergonomic positioning. Reduce your dependency on scarce labor and upgrade your operations with ROI’s PALLETPOD mobile compact palletizer. Our patented equipment eliminates the use of injury-prone manual handling labor for palletizing and depalletizing activities. PALLETPOD mitigates human factor risks while increasing the quality assurance of your operations. And, you improve the job content and retention of your valued associates. Bending and reaching injuries related to manual handling are among the most frequent occurrences in any production or warehousing environment. PALLETPOD virtually eliminates repetitive motion injuries by doing the heavy lifting, stacking, and wrapping for you. PALLETPOD‘s minimized footprint can fit into almost any space-constrained facility without your having to reorganize your workflow or production layout. ROI designs and builds a range of productivity-enhancing equipment to make your process as seamless and efficient as possible. Our products and solutions are simple to install and reliable to operate. Whether you want to increase pallet dispensing capabilities or replace manual handling, we’re confident that we can provide exactly what you’re looking for. If you’re working with diesel truck engines, aircraft engines, large construction equipment or the like, you need a POWERSTAND. ROI provides a range of super heavy duty work holding stands that accommodate cantilevered loads weighing up to 8,000 lbs (3,600 kg). Push button controls provide both precise rotation and vertical adjustment to securely and ergonomically position your engine, gearbox, airend, dies, and more. Standard and customized mounting brackets are available to fit your specific applications. ROI Industries Group is much more than a focused suite of innovative equipment and proven technology. We are genuinely driven by your satisfaction and peace of mind – both operational and financial. We love to solve tough problems with elegantly simple equipment. We also have a track record of solving simple problems with tough equipment – like how to turn an 8,000 lb diesel engine or stack a pallet with 45 lb boxes of frozen lasagna (over and over and over, again). We know our way around robots and automation. But we are not nearly as enamored by the technology as we are by solving your problem with practical, reliable, and durable equipment that you can justify financially. Our mission is your Return On Investment, and why our company name is ROI. Manual palletizing – and depalletizing – is a common practice in North America (and literally dates back centuries). At ROI, we have one question: why? Why ask your employees do such a tough and tedious task? Palletizing is frequently rated the worst job in a plant. And it is often difficult to hire and retain the employees that are capable of lifting the necessary weight or stacking to the required height. Why continue to put your employees at risk? The manual stacking of products has been shown to be the source of up to 40% workplace injuries in production and warehousing facilities. These repetitive motion injuries to the back, shoulder, hand, and knees also frequently turn out to be chronic. Why staff – and continually restaff – for a job that is not a core competency or required for operational excellence yet consumes hiring, training, and supervisory resources? PALLETPOD can virtually eliminate all the issues related to manual palletizing. It is a compact, mobile, and cost effective solution. It is easy to specify, validate, install, operate, and maintain. Available for purchase or lease, PALLETPOD is an adaptable and durable palletizing machine for stand-alone operation and highly automated end-of-line operations. So, why not let PALLETPOD do your heavy lifting? ROI developed the PALLETPOD for ease and access. Facilities simply select from a suite of standard compact-footprint machines and modular components for quick configuration and seamless integration. We also designed our palletizing equipment to be budget friendly with a typical payback of two years or less. 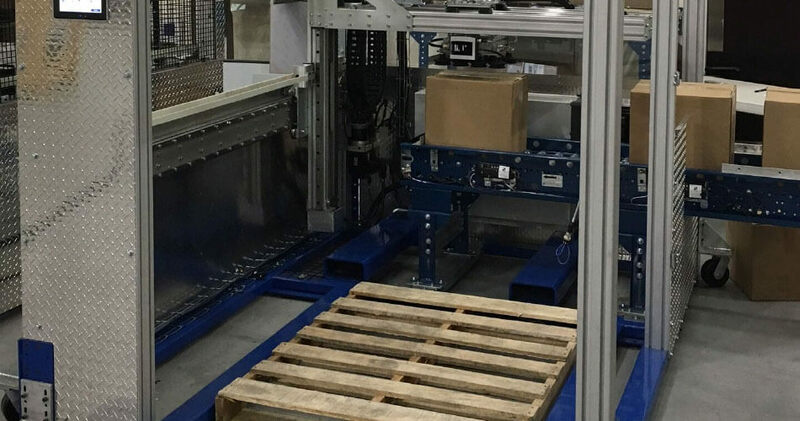 Each PALLETPOD can be used as a stand-alone semi-automated palletizer, integrated with machinery already in place, or installed as a fully automated suite of PALLETPOD components. These include pallet dispensing, infeed and outfeed pallet conveyor, tier / slip sheet dispensing, customized end of arm tooling, custom infeed conveyor and much more.